This is the page where we tell you about our adventures over the years here at VED (aka Visual Edge Design) in hopes that you will have a better understanding of who we are, and how we got here. Let's see...It all started in 1999, when Visual Edge Design was founded by Grant (the tall, good looking guy to the right) in Durango, Colorado. He was joined shortly thereafter by his wife, Siouxie (that's me, nuzzled up against Grant). By the end of our first year, we had acquired such notable clients as Grammy Award Winning Jazz Musician, Chick Corea and Peabody Award Winner, Def Poetry Jam. This provided great credibility for us in the early days. In the summer of 2000, we had nearly 80 clients and were growing, but because of a lack of high speed Internet access in Durango, CO., we relocated to the Tampa Bay area. When we arrived in Clearwater we knew that we would need some help, so we moved into our first "real" office and hired our first "employee" (actually he is a good friend who just thought it would be fun to work with us - he stayed with us for the next two years). At the close of 2002, we had added a couple more staff and soon had over 250 clients nationwide by word of mouth and referrals alone. It was fast-paced, but fun! As our client list continued to grow, so did our need for additional staff (and we still had one office that was pretty empty) so we searched for more great people to work with and by the end of 2003, we were up to 7 staff, still hiring, and on the hunt for a bigger office. We wanted to be close to Downtown and eventually found the perfect building (with plenty of parking), so we made an offer. On Feb 14th, 2004 our offer was accepted and shortly after that, we had our very own building! It needed some work, but it was ours (and that was the best part!) We moved in on Memorial Day weekend and began hiring more people while half the building was under construction. After months of renovations, we were at maximum capacity and 400 clients. We had dust everywhere and people squished up against each other in half the building, and it was awesome. By the end of 2004, we were occupying the whole building (while still painting, laying tile, leveling floors, etc). During all of this, we were nominated for "Small Business of the Year" by the Clearwater Chamber of Commerce as well as "The 2005 Best Places to Work in Tampa Bay" on behalf of the Tampa Bay Business Journal. While we did not win the Small Business of the Year, we were extremely honored to have been nominated in the first place. 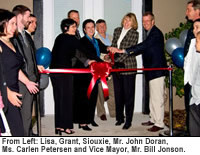 On January 14th, 2005 we celebrated our 5th Anniversary (in business) and had the Grand Opening Celebration of our newly completed building. We had over 180 friends and guests (mostly friends) with live performances by both Kevin Danzig, and Michael Graves. The whole event was really wonderful. City of Clearwater Vice Mayor, Mr. Bill Jonson was our guest speaker and accompanied by City Council Members Carlen Petersen and John Doran, who assisted with the ribbon cutting. The Clearwater Chamber of Commerce were kind enough to share their huge red scissors, and Kiku Japanese Restaurant and Sushi Bar provided the incredible food. This was the perfect kick off for one of our best years yet. In February we found out that we had the prestigious honor of being listed as one of the top 25 web design and development firms in Tampa Bay by the Tampa Bay Business Journal (number 16!). In May we were notified that we were finalist for the Best Places to Work in Tampa Bay, and we took 2nd Place in the Nearly Big category on April 28th! We became an authorized government vendor, and have completed work for the State Department and other larger projects for a couple well-known companies, including Aegon. The fun continues as we take on larger projects, smaller projects, creative projects and complex projects. We like it that way as it keeps our team challenged. Once again, we were recognized by the Tampa Bay Business Journal as one of the Top 15 Web Design Firms in Tampa Bay. We have a great team, a wonderful work environment and we love what we do. We launched our Small Business Website Packages and are thrilled be "going back to our roots" - meaning that we are going back to our core beliefs - providing fabulous websites for a reasonable price to the small business. Grant and I are involved full time in the strategic planning, design and programming process on a daily basis, and we're excited to see what the future will bring.